The third installment of my UL Beginners Guide, and we will be talking about the kitchen and miscellaneous other items. The kitchen is an essential piece of equipment, and saving a pound or two is not so difficult. And also in the miscellaneous items department - from a knife over hygiene to 1st Aid and fixing - there are ways to cut weight easily, without giving up safety and comfort. I am a BushBuddy Ultra user. There is one new wood burning stove in development which caught my interest, with the fitting name of "Inferno" which I might be getting in the future, but for the moment the BBU and my little back-up MYOG top burner stove are all I take out into the wild. However, before starting with MYOG projects and getting a BBU, I had a Trangia as probably 90% of the backpacking population in Scandinavia. The Trangia + the full fuel bottle were about 2000 g, so here's a easy way to get rid of at least a kilogram. The Trangia burner is good, but you need a pot holder for it which will add additional weight. There are enough MYOG guides out in the internet, so use your Google skills to find them if you need one. I instead would build a new side burner stove out of a Pepsi can, instructions can be found on Zenstoves.net. It should weigh in at about 15 g max, and you don't need a pot holder. You can use on of the Trangia pots with your new stove, or get a lighter pot, preferably out of Titanium. The fuel bottle I would replace with a 100 ml or 200 ml bottle, these can be found in your outdoor store of choice or ordered online. Much lighter, and in case you're not out for two weeks in a row the smaller bottles should hold sufficient fuel for a day or two. Now you might want to have a lid for your Trangia pot, and some household aluminum foil is a cheap and easy solution for that. In case you're not using a Spork yet, now is a good time to get one - the LMF Spork is with 10 g one of the lightest ones available; and they cost only 2€ so you don't even need to rob a bank to afford one! So, that should have brought down your kitchen to a very reasonable weight of not more than 400 g max excluding fuel. In case you're wondering where's the plate, cup, knife, mixer and whatnot in that list, let me enlighten you. You eat from the pot, as that also safes you doing more dishes. If you want to drink something warm, you drink from the pot. You use your knife for cutting, and your Spork for stirring and mixing. No need to carry specialized items with you. Salt and Pepper as well as sugar can go into a small Ziplock bag, if you need any of it. Drinking is important, and you should drink plenty if walking - two to three liters minimum. I have a Nalgene 1l bottle, a sturdy piece of gear, but I didn't like that it was rather heavy and always takes away a lot of space, even when empty. So I invested into two 1l Platypus collapsable bottles, light as a feather at 23 g and they store away very nicely when empty. They fit perfectly into the side pockets of my ULA Ohm, and I can take them out and put them back while walking. On the right my previous washing bag, on the left the UL approach, trimmed down to what I really need if I go out for a few days. I re-used some plastic Minttu liquor bottles for shampoo and shower gel, and have a very nice travel tooth brush box, where the tooth paste and a tooth pick are integrated. I can refill the tooth paste, and the tooth brush is protected from eventual dirt. Some tooth silk, which you also can use to fix something rounds out the hygiene bag. 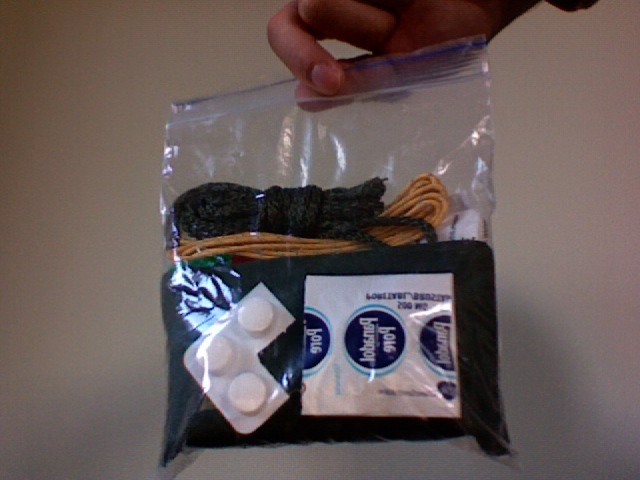 Toilet paper in an extra Ziplock bag, and the two together are under 200 g.
In there is some spare guyline, some cord, medicines, band-aid and bandage, safety pins, some wet towels and an emergency whistle. Its all I need and I feel confident and safe with this in case something should happen. You might need a different kit depending on the season and where you're walking, so think what you need and be safe. When it gets dark, you will need a light to see. I carry a Petzl Tikka Plus, not UL at 77 g but it does the job very fine. I would replace it with a Petzl eLite, which weights 23 g and also has a red LED, which is very useful if you're walking in the dark as your night vision doesn't get distorted. The 2009 version also has a whistle, so it will allow me to leave the other whistle at home. Finally, a knife. Dave reviewed just last week a Opinel knife, which weights 30 g and costs less than 10€, so in case you're carrying around a Leatherman Multitool or a Rambo knife, head over to Dave and see what he found out. I myself carry a German Army knife which weights 86 g. Besides the blade it has a saw which I find useful in case I can't break some wood for my BushBuddy, a piercing tool of sorts (I'm no knife expert =) and a bottle opener. The latter I rarely use outdoors hiking, but all the other tools come in handy regularly. That's it for today. Tomorrow or the day after I will wrap up this little series, and post a complete packlist of mine for a long weekend trip to give you an idea of what I have with me on a usual trip out. I'm looking forward to your comments!